Everybody loves a birthday party, and there’s a lot to enjoy at Papá Luis’fiesta! The children excitedly count the candy that will fill the piñata. The nieces bring the candles for the birthday cake that Mamá Marta baked. Family and friends begin to arrive, and soon, they surprise Papá Luis with his special celebration. 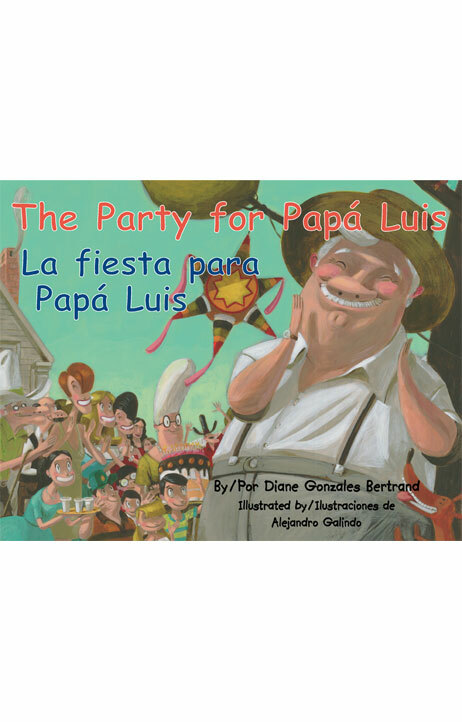 Told in lively verse, this cumulative tale builds from one page to the next as popular children’s book author Diane Gonzales Bertrand presents a charming look at a big family gathering that celebrates the patriarch’s birthday. Like her previous award-winning book, The Empanadas that Abuela Made / Las empanadas que hacía la abuela, Diane Gonzales Bertrand gives emerging readers another book that creates confidence and skills through repetition and sentence building. Accompanied by Alejandro Galindo’s whimsical illustrations of big-eyed children and elderly family members dancing and enjoying each other, this fun-filled fiesta is sure to delight children ages 4 – 8. After reading this appealing bilingual story, kids will eagerly begin planning their own birthday parties. DIANE GONZALES BERTRAND is the author of numerous books for children. They include Cecilia and Miguel Are Best Friends / Cecilia y Miguel son mejores amigos (Piñata Books, 2014); Sofía and the Purple Dress / Sofía y el vestido morado (Piñata Books, 2012); Adelita and the Veggie Cousins / Adelita y las primas verduritas (Piñata Books, 2011); The Party for Papá Luis / La fiesta para Papá Luis (2010); We Are Cousins / Somos primos (2007); Ricardo’s Race / La carrera de Ricardo (2007); The Empanadas That Abuela Made / Las empanadas que hacía la abuela (2002); Uncle Chente’s Picnic / El picnic de Tío Chente, (2001); The Last Doll / La última muñeca (2001); Family, Familia (1999); and Sip, Slurp, Soup, Soup / Caldo, caldo, caldo (1997). A lifelong resident of San Antonio, Bertrand teaches at St. Mary’s University, where she is also Writer in Residence.